SARASOTA, Fla. (April 12, 2018) — The Talent4Tomorrow Partnership, a collective impact team of local organizations focused on increasing college and credential attainment in Sarasota County, announces that the Sarasota County School District has been recognized as having the highest FAFSA (Free Application for Federal Student Aid) completion rate in the state, according to the Florida College Access Network (FCAN). This is the third year in a row that Sarasota County has been named number one in the state for “Large Districts” in FCAN’s annual Florida FAFSA Challenge. Completing the FAFSA is the first step to accessing financial aid for college, as well as a leading indicator of college attendance. But research indicates that Florida high school graduates leave behind over $100 million in federal Pell Grants alone by not completing the form. Through targeted efforts developed by Talent4Tomorrow in partnership with the school district, 47.8% of Sarasota County high school seniors completed the FAFSA as of March 31, 2018. According to FCAN, the incremental increase in FAFSA completion over the last two years has resulted in approximately $800,000 in additional Pell grants available for Sarasota County graduates to pursue their higher-education goals, with the average student award approximately $4,000. “The Talent4Tomorrow initiative demonstrates an example of a true collaboration between a broad-range of organizations coming together for a common goal – the future of our community’s youth. The Chamber believes strongly in this alliance and the outcomes are a testament to the strength and commitment that the partners bring to the table,” said Kevin Cooper, President of the Greater Sarasota Chamber of Commerce which serves as the ‘backbone’ organization for Talent4Tomorrow. The Talent4Tomorrow partners worked with the District to implement several strategies that assisted graduating high school seniors and their families with completing the financial aid form. Talent4Tomorrow hosted FAFSA labs at high schools, with support from local college financial aid officers and other community volunteers, to assist students and their parents in the application process. It also implemented a communications plan to raise awareness about FAFSA that included flyers, text messages, emails, classroom visits, morning announcements, outreach to youth-serving partners and the faith-based community, press releases and social media posts. 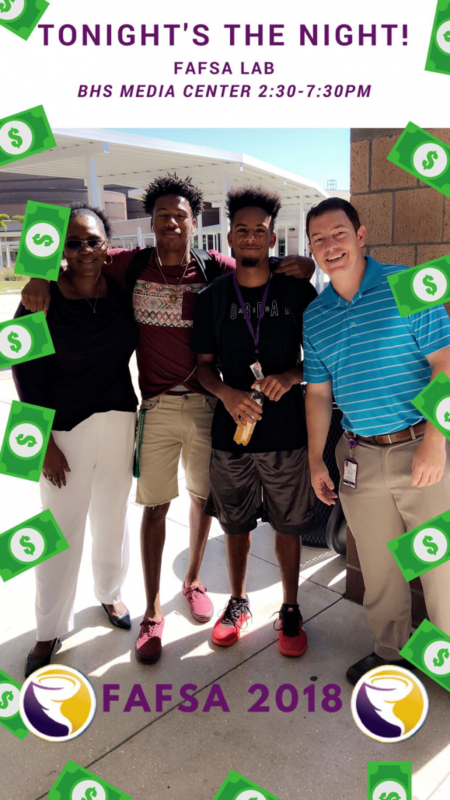 The Partnership developed some new techniques this year, such as the innovative use of Snapchat geofilters, introduced by CareerEdge Funders Collaborative and piloted at Booker High School. A geofilter is similar to a frame or sticker that can go on a Snapchat photo and is shared with the user’s friends. An organization or individual pays to have the filter available in Snapchat for a specific location and period of time. With approval from the school, the electronic FAFSA lab filter was made available in the cafeteria for the students. On lab day alone, the filter was swiped by 367 students, and 64 of them posted these framed photos on their account, which resulted in 2,900 views of the FAFSA filter. According to FCAN, Booker High School had the second highest completion rate improvement in the District compared to last year, with a 9% increase. The Snapchat strategy was seen as a positive application of a platform used by students daily. The Talent4Tomorrow Partnership plans to expand the use of this social media tool next year and will continue to look for ways to engage and connect with students on the value of completing the FAFSA. Support for these programs and events comes from Gulf Coast Community Foundation, the Charles & Margery Barancik Foundation, Community Foundation of Sarasota County, with matching funds from the Florida Philanthropic Network through its College Access & Success Initiative (CASI), which is supported by the Helios Education Foundation and The Kresge Foundation. More information about FCAN and the FAFSA Challenge Winners is available here.